Tusk is touring five European capitals in an attempt to defuse contentious issues ahead of the EU summit on 18-19 February, dedicated to renegotiating the relation between the United Kingdom and the European Union. The other issue of the summit is the migration crisis. 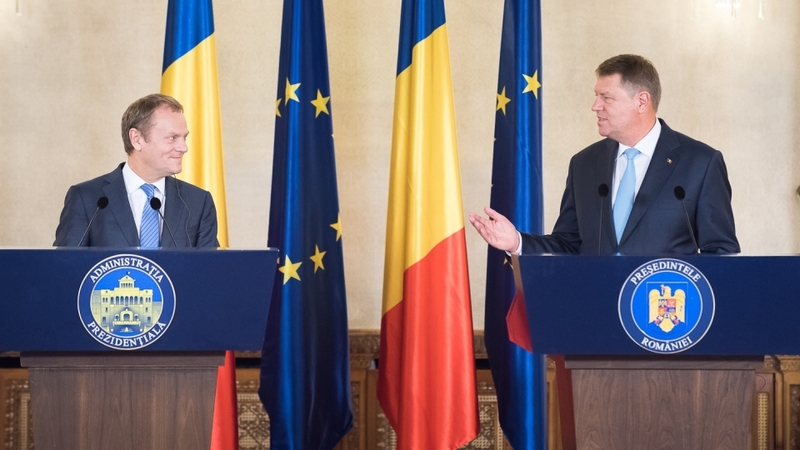 Before meeting Romanian President Klaus Iohannis, Tusk met on the same day with French President François Hollande, and will be meeting Greek Prime Minister Alexis Tsipras, Czech Prime Minister Bohuslav Sobotka and German Chancellor Angela Merkel today (16 February). “In Romania as well as in other EU countries, the issue of social benefits continues to be the most difficult one. Let me assure you that the proposal I have put on the table is a fair and balanced one. The safeguard mechanism on access to in-work benefits is not designed to apply to EU citizens currently working in the UK. This proposal protects the freedom of movement, while helping the UK to address its concerns when it comes to their specific system of in-work benefits,” Tusk stated. The in-work benefits have indeed emerged as the greatest concern of central and eastern EU members. The so-called Visegrad group has met yesterday to adopt a joint decision over the issue. Romanian President Klaus Iohannis said that his country wanted the United Kingdom to remain in the EU. With respect to London`s request concerning limiting access to benefits, the president declared that such a measure would have to be non-discriminatory and exceptional in nature. In the aftermath of the proposals made by the Donald Tusk on 2 February with respect to the renegotiation desired by London, Romania has constantly expressed its openness toward identifying pertinent solutions that would maintain the United Kingdom within the EU. “The European Union needs the United Kingdom and the United Kingdom needs the European Union – this is our position, which we have expressed on all occasions,” stated Iohannis, adding that, in general, the objectives of the package proposed by Oresident Tusk are “convergent with the vision and interests of Romania”. The solutions have to be based on fundamental values and European principles, he said. In what concerns the reforms on economic governance, competitiveness and sovereignty, the head of the Romanian state has stated that Bucharest is willing to support the proposals presented by Tusk. The safeguard mechanism that will allow limiting for a short period access to certain types of social benefits has to be non-discriminatory, exceptional in nature and as limited in time as possible, and its justifications have to be pertinent, highlighted the Romanian president. The statements of the head of state have also hinted to the fact that Romania will also agree with the proposal that concerns indexing allowances for the children that are not residing with their parents in the state where the latter work. “We will aim to eliminate any discrimination risks for Romanian citizens. In addition, we will aim that any possible indexing will not be open for extension to other social benefits”, stated Iohannis. The same messages were also shared with Brussels by Prime Minister Dacian Cioloș, when he met with Commission President Jean-Claude Juncker. Tusk drew attention to the fact the negotiations on reform were “extremely important” as the EU member status of the United Kingdom was in play, as well as the future of the EU. “We will all have to decide, both where we cannot and where we will not compromise on fundamental liberties and values,” Tusk said. The President of the European Council has emphasised that a series of political elements have remain unsolved, such as those referring to the modification of the treaty, the emergency brake mechanism for non-Euro countries, the safeguard mechanism, access to social benefits and the notion of a more integrated union. On migration, Iohannis reiterated that Romania wishes to contribute in a constructive manner to finding a solution to the crisis. “The emphasis has to be placed on implementing the decisions already taken at the European level for combating illegal migration, on efficiently protecting the external borders of the European Union, but also on the cooperation with the origin and transit states. In this context, it is necessary to implement as fast as possible the EU- Turkey action plan”, stated Iohannis. He also mentioned that an efficient policy for returning those who have no right to benefit from asylum has to represent “an essential component of the migration management process”. In this context, Iohannis has also made a reference to Schengen, expressing his hope that the member states will make all necessary efforts to maintain it. “Despite the current situation, which has made certain member states reintroduce internal border controls in the Schengen area, we hope that these will be temporary and exceptional, so as not to affect the freedom of movement within the European Union,” said Iohannis. Warning that the current migration crisis is testing the EU to “its limits”, Donald Tusk said he wants current leaders to engage this week in a sincere discussion. In his opinion, the most important issue is the protection of EU external borders, in particular with respect to controlling the flux of migrants. He also mentioned the need of increasing humanitarian aid for the neighbouring countries of Syria. Tusk also referred to the agreement with Turkey which has to work and lead to a significant drop of the number of arrivals, “something that we are still waiting to happen”. Another problem identified by the head of the European Council was the humanitarian situation of the migrants in Greece and of those on the West Balkans route.